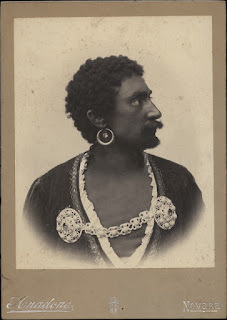 This totally forgotten tenor was the creator of Silvio in the world premiere of R. Leoncavallo’s ‘’Pagliacci’’ at the Teatro Dal Verme, Milano (1892). The next year he went to Melbourne, where again appeared in ‘’Pagliacci’’. Although he was successful in tenor repertoire (Otello (see photo) Sansone and Siegmund), but he couldn’t continue his career as tenor and until his retirement, like Oreste Milei, sang again repertoire of baritone. He retired from the stage in 1911. Roussel never made records.